United States - The European Union’s piecemeal solutions are coming apart. Only a surge of financial and political creativity can avoid a catastrophe, writes financier George Soros in Foreign Policy. The refugee crisis was already leading to the slow disintegration of the EU. Then, on June 23, it contributed to an even greater calamity — Brexit. Both of these crises have reinforced xenophobic, nationalist movements across the continent. They will try to win a series of key votes in the coming year — including national elections in France, the Netherlands, and Germany in 2017, a referendum in Hungary on EU refugee policy on Oct. 2, a rerun of the Austrian presidential election on the same day, and a constitutional referendum in Italy in October or November of this year. 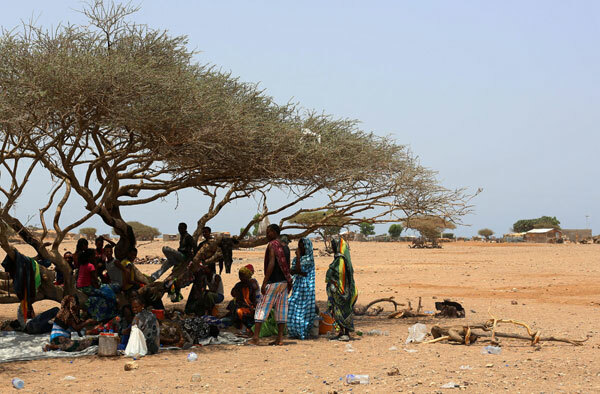 Djibouti - The other day, on the outskirts of Fantahero, a small village in the desert of northern Djibouti, Sebhatou Mellis was sheltering from a-hundred-and-four-degree heat in the shade of an acacia tree, writes Nicholas Niarchos for The New Yorker. Mellis, who is twenty-six and has the rangy build of a runner, was about a thousand miles away from his home, in the impoverished Tigray region of northern Ethiopia. There, he and his family had taken a government loan to help improve his farm, tried to invest it, and failed, he told me. “At the end, the money was finished, and all the people began to insult us and say that we took the money from the government and used it badly,” he said. Mellis had come to Fantahero four days earlier, walking and hitching rides through the Danakil Desert with about a dozen other Tigrayans, a journey that took them about three weeks. Mellis’s ultimate destination, he hopes, will be Saudi Arabia, where, if he’s lucky, he’ll be able to work illegally. The UN General Assembly will host a Summit to address large movements of refugees and migrants, with the aim of bringing countries together to achieve a more humane and coordinated approach. Learn more about it here. Baby Naivasha was born yesterday in Juba, South Sudan. 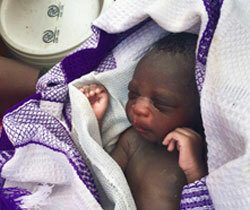 IOM medical staff and midwives helped ensure that her mother had a safe place to deliver the baby. Follow us. PJ: "My experience when we were fleeing from conflict is one that lives with me, which is why I’ve made it my mission to rebuild Sierra Leone." 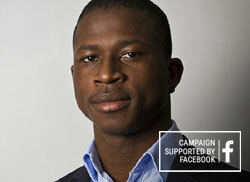 How to contribute to the i am a migrant campaign. Watch here. 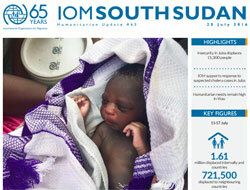 IOM's Humanitarian Update in South Sudan | Read here. "We must address the factors that lead people to leave their homes. Migration is a fact of life in our interconnected, highly mobile, world." - UN Deputy Secretary-General Jan Eliasson. More here. The Guardian reported that despite taking the dangerous journey by land and by sea from Iraq to Europe, some refugees decide to return home after realizing life in the EU does not meet their expectations. Reuters and BBC reported that MSF found the bodies of 21 women and one man in a rubber dinghy adrift near the Libyan coast on Wednesday. Reuters reported that Italian police have broken up a criminal ring which smuggled at least 100 migrants from the northern Italian city of Milan to other European countries in one of the biggest operations of its kind. UN reported comments by UN Deputy SG Jan Eliasson at a Global Forum on Migration & Development meeting in New York welcoming IOM’s impending entry to the UN. The Wall Street Journal reported warnings by German officials that unaccompanied minors arriving in the country are especially prone to crime or radicalization. The warnings followed an axe attack by an Afghan teenager on train passengers in southern Germany. For comment / interviews on today's news, please go to the contact(s) listed at the end of each press briefing note.